Hi everyone! 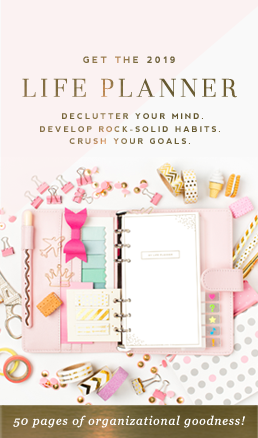 Today I have a really great printable for you to enjoy and it’s totally FREE! Can I get a woot-woot for that?! — WOOT-WOOT! 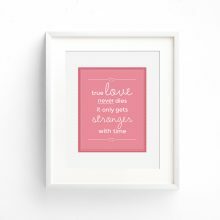 I decided to create a really great subway-style printable that I could frame in her room, as well as use as a scrapbook page about bedtime and the special time we spend together singing her song. I had the 12×12 page printed at Costco ($2.99) and inserted it in the frame I already had and now she has a great piece of artwork in her room that she loves to point out to all of our house guests. 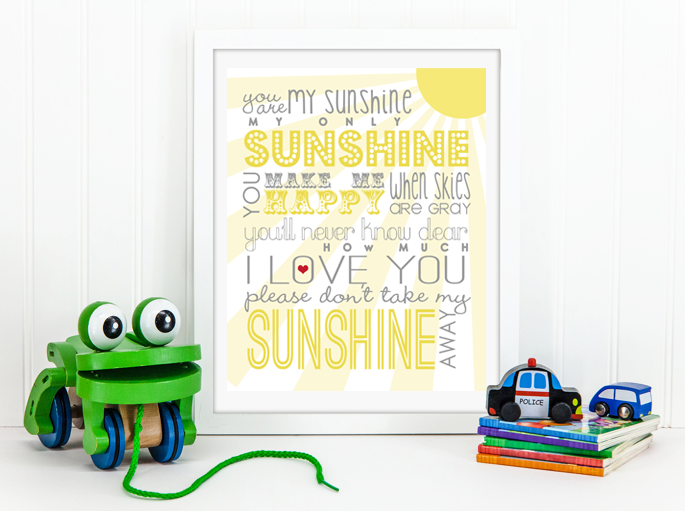 The Sunshine Printable is available as an 8×10 or as a 12×12, so the possibilities are endless! 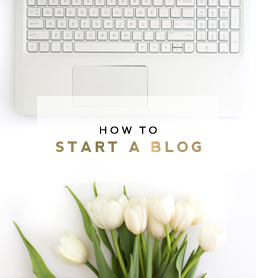 Have fun with it and if you decide to download it and use it somewhere, I would love if you would share a photo of how you used it on social media using the hashtag #designerblogs. Just click the button below, download, and print! Super easy! That is so cute, Courtney! I am going to print it out right now! Hi! Can you send me a 4×6 version of this? I want to hand it out at Thursday night camp but the 8×10 requires cropping and cuts out too much. 🙁 I sent a message on FB but I’m not sure which one you will see first. By the time you see this, I will be at Girls Camp. I listed my husband’s email address so he can receive and upload it to costco and send it up to me. If you could resize that, I would really appreciate it! Our theme is LOL- Lovers of Light and the light source we chose (stake) is Sun (which also has double meaning as “The Son”). This subway art would be a neat touch for the final night when we sing an edited version of You are my Sunshine with verses changed to fit the Arise and shine forth theme. Thanks so much for your help!! Is there any way that the word sunshine be changed to sunrise? My baby sister loves it when I sing this song with her name in place of sunshine. I’d love the 4 x 6 or a 5 x 7 size, ,too! Perfect size to set on a dresser, shelf, etc. Thanks! Thank you so much! I cant wait to print this and hang it on my little girl’s wall! I sing this song to her all the time, and my mom use to sing it to me, and my brother and sisters, when we were little. Also, her room is yellow and gray! I love it! Courtney – thank you SO much, I had already decided to send my friend in Missouri a Box of Sunshine (http://pinterest.com/pin/14496030021472838/) for her birthday in November (I live in Florida, the Sunshine State) so I’m going to frame your printable and include it in her box. Perfect! She’s going to love it. This is wonderful and just in time to add to my freshly painted living room wall. Any chance you have it in 5 x7? This was one of my mom’s favorite songs and will always be a special song for me. I have been wanting to have something like this, but had found anything. so thank you for sharing. Do you have Amazing Grace by chance that was her other song. Hi! I love this printout! I also used the twinkle twinkle printout as well. I made them into hanging wall canvasas and plan on hanging them in my sons playroom! I am so thrilled at how they came out! I’d love to share my pic, but I couldn’t figure out how to upload my pic here! Thanks for the cute printouts!!!!! Thank you so much!! I sing this song to my grandson, Dylan, all the time. So nice of you to share your beautiful creation!! I love, love, love this. Is there any way to change the colors for my granddaughters room? Thank you so much. I sing this song to me little girl ever day… since she was born and would love to put it in her room….but I would like the colors changed to Pink, Light Blue and Light Yellow. I have my ruffled ribbon socks on etsy and thought we could exchange work if you have a little girl. It is Gracie LaRae’s Boutique. Hi! I LOVE this printable, it’s the song I’ve always sang to my babies!!!! But….I cannot get it to cooperate as a download! Would you mind sending it to me in a 4×6 version? I would be sooooo grateful! Yellow is my favorite color and this is awesome…thanks for sharing. Thank you so much! This was my grandma’s favorite song and is a special way to keep her close when I sing it to my baby boy. I’ve been wanting to get this wall art for his room and this is perfect! Great idea. Thanks for sharing your talent with us. I like to end the song with “and I love you more everyday” instead of please don’t take my sunshine away. Any chance you would be able to make that switch for me and my little girl? My Mum always sang this to me when I was little! I’m going to print and frame it and give it to her as a present. I’m sure it’ll bring a tear to her eye! We had this song at our wedding 30 years ago. I now sing it with my granddaughters ages 2 & 6 in the car when we r traveling. 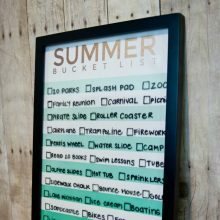 i plan to copy & put in my sunroom! Thx! Thanks so much for sharing this adorabl print! 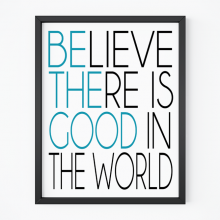 I will hang it in my new kitchen… I always sing it to my kids, grandkids, and husband… Love it! My three year old Grandson (just turned 3) sings this song. It was a song my Mom used to always sing and my daughter bought me one of those black and white signs with these words on it to hang on the wall. My grandson one day was sitting next to me and all of sudden started singing this song! Brought tears to my eyes thinking of my Mom who passed away. When I saw this post I knew I had to print it off! How timely! Thank You! I love this! Have been looking for kid song lyrics to hang in my kids’ toy room. I suggest you make “The Itsy Bitsy Spider” and “Row Row Row Your Boat”. I would definitely hang those along with “you are my sunshine” and “twinkle twinkle” that you have. Thanks! Thank you so much for this beautiful printable. I have been singing this song to my grand daughter since she was born, she is 5 now and loves it! This printable will definitely make her smile. This is just gorgeous! I am at the beginning of opening my small online children decor business. Would it be ok to print and have this for re-sell? I’m a little ignorant in the legal scheme of things. Hope it is, I think it would be a hit!! You would need to purchase a commercial use license in order to re-sell it. You can contact us at [email protected] for more info. I cannot believe people are so rude to ask you to make another size for them. Ladies, do it yourself or use what she has already made!!! Courtney has taken lots of time now and in asking her to do more and more is really rude and not very thankful for what she has already done! I’m just saying…. Aww love this my husband sings this to me every night before we go to bed (we can’t even remember why it started) and now we sing it too our two young kids every night before bed. We live in Scotland and I’ve had this fab printable made into a acrylic for the playroom and it looks fab! LOVE this! Thank you so much! Working on my the nursery for our new baby girl and going with a “You are My Sunshine” theme. This is absolutely perfect for it. Now I am looking for a vintage wood frame to put this in and I will paint it white or possibly yellow! You have made my day!!!!!!! Thanks for this! My children will love it!!! Thank you so much for making this and for making it available for a free. It is just what I want to hang in my daughter’s room. Thank u so much I’ve sung you are my sunshine to my granddaughter Hannah since she was born she is now 3 and knows all the words. It is Our song. I sang this song to my daughter for years and now she is expecting her first baby in January. This is perfect. Thanks so much!!! Thank you so much for sharing.. I almost didnt open this email right away but something was drawing me to do it and when I did I started crying. My momma used to sing this to me and then to my older boys. I lost my momma in 2002 and I would do anything to hear her sing to me again whether she could sing or not so just remember that when you sing to your little girl, She will only remember her mommy singing to her not how you sounded!!!! Im so happy I found this!!! You are my sunshine is a special lil song shared between my mother and daughter. We have the song painted in our house in black grey and yellow, the same colors as this. We will be printing this up for my mother to hang in her house. Thank you for a great and honest post. Well done on a huge success. Unfortunately we only offer this printable in the sizes above. Hey! I’m really hoping it can help me! I am lookin for the printable to print as an a1 poster. We could custom create one in this size for you. If interested, please visit our custom quote order form and list $15 as the quote total for this. Hope this helps!